Looking for a "CUSTOM 4 BEDROOM COUNTRY CHARMER"? This incredible 4 bd., 2 bath, 2 car garage home w/ over 2100 sqft of luxury living has everything you need! 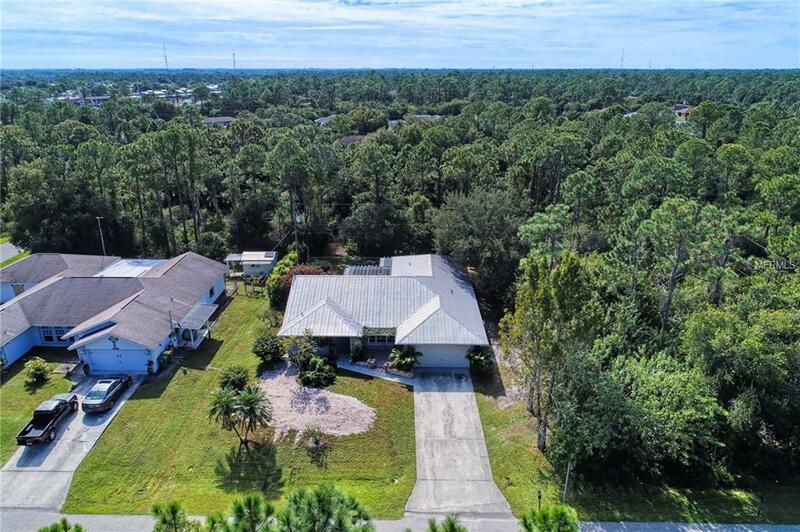 Tucked in a lush tropical palm treed setting w/ paver deck entryway! Quality built home w/ metal roof built up on a stem wall (higher elevation!) w/ rustic accents & wood trim designs w/ built in lighted cabinetry though out! Open split plan includes angular ceilings with wainscoting accents, wood plank floors, crown molding & built in hutch in the formal dining! lighted shelving/hutch in master bd, dining rm & built in entertainment center in family rm w/ impressive wood vinyl water resistant flooring. Gourmet kitchen has large granite center island kitchen w/ hanging pot rack & built in sink w/small preparation wet sink! Glass top stove is built-in with tiled back splash & pot filler with custom built-in exhaust fan, stainless built in convection oven, microwave & refrigerator w/ freezer on bottom. Numerous cabinetry, w/ additional serving station w/ 2 appliance caddys, built in wine rack, soft close doors & pull out drawers. Master bd. has a separate office/hobby rm w/ access to Lanai! Master bath offers pillared columns dual sinks, luxury garden tub w/spa jets & tiled walk-in shower. Back lanai leads to a covered screened arbor w/ paver deck patio with fish pond! Fenced back yard too! Many extras & upgrades! Must see! New septic tank recently added. Close to shopping, schools & easy 1-75 access! You wont want to miss this one!